Attention Law student preparing for the Bar Exam! How a law graduate who ranked in the bottom half of his class, failed the MPRE twice, and had less than a coin flip chance of passing, was able to use a little known secret shared by Oprah, Michael Phelps, and Wayne Dyer to PASS the California bar exam on his 1ST ATTEMPT in less time than most others! And a PASS the BAR EXAM GUARANTEE it will work for YOU too! Let me let you in on a LITTLE SECRET that I know and used to pass my bar exam. I graduated in the lower half of my law school class and after graduation, I received a letter from the administration telling me, based on my class rank, my statistical chances for passing the bar exam were less than 33%! Not only that, I was one of the few that failed the MPRE (twice, actually). You see, I wasn’t supposed to pass. I realized I was not going to be able to just study my way through the bar exam. 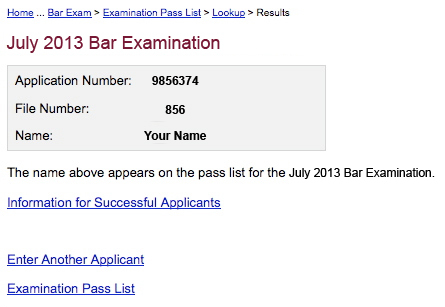 After all, people who were much better students than me had failed the bar exam… multiple times before finally passing! I ended up learning about a certain power just in the nick of time before my bar exam. That power is called the subconscious mind. You may have heard that we only use 10% of our brain. Well, that’s because only 10% of our control in life is through our conscious brain. 90% of our brain and behavior is controlled by our subconscious mind. So, if we want to gain TRUE power, we have to tap into our subconscious mind. During my bar exam, I used the same techniques utilized by top Olympic athletes and performers – like Oprah Winfrey, Wayne Dyer, Tony Robbins, Michael Phelps, Tom Brady, and others! And NOW is the Time to Get this power for yourself. The Bar Exam is coming up soon. 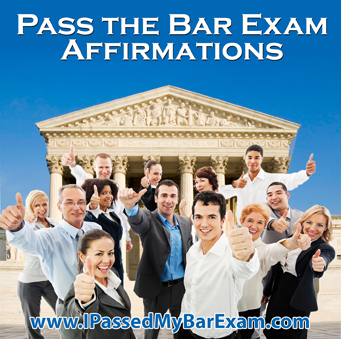 What would be the real difference between passing and not passing your bar exam? Start Making Dozens of Thousands of DOLLARS! First year attorneys might make between $50,000 to $100,000 per year. Start getting your debt paid off before interest accrues. While others are preparing for another 6 months, you could be making anywhere between $25,000 to $50,000! Plus, you get a head start for bonuses and salary raises! Save 6 months of TIME! The bar exam comes around only twice per year. 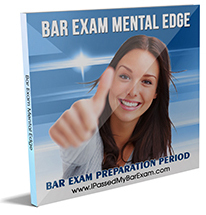 If you pass the bar exam, you are 6 months ahead of the game! You’re complete and can now MOVE ON WITH YOUR LIFE. Studying for the bar exam is one of the most trying, stressful, and least fun times you’ll have EVER in your life. When you pass, you go through it only this time and save yourself the headache of having to repeat and redo the entire experience again! How good will it feel to be going to your SWEARING-IN CEREMONY? 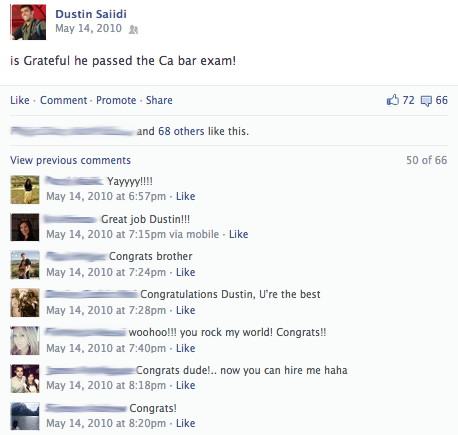 The bar exam has been on your mind since DAY 1 of law school. This mountain is now CONQUERED. Knowing this big mountain that has NOW been climbed, and you NEVER have to see the bar exam again. That’s incredibly rewarding and peaceful. SHARE PASSING RESULTS on FACEBOOK. Imagine the dozens of likes, and comments you’re going to get! SCENARIO #2: If you FAIL the BAR EXAM? Lose 6 months of Time! The next half year or longer of your life is determined by what you do now. Do EVERYTHING it takes to get yourself ready. With this program you can make that a reality. You will discover a suprrisingly simple system to be able to enter into a super confident, super performing state at will on command instantly. It has many of the same components I used during my bar exam preparation. If I hadn’t used that Mental Edge on my bar exam prep, I might still have been studying years later! Here’s what you get with your package when you order today. If you play certain images and words in your mind enough times, it will become your reality. This program will create your reality as a bar exam passer now. 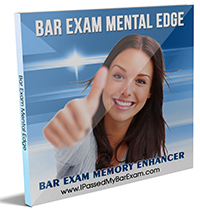 Become a Confident Bar Exam Passer! And you can have it within minutes from now! I normally charge my 1-on-1 clients $125 to do a session for each of these audios. That would be $375 for the full package. But your price isn’t $375. And when you order today, you get these additional bonuses absolutely FREE! 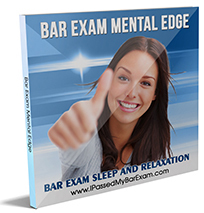 GET YOUR COPY of the Bar Exam Mental Edge Today! The sooner you get this and start listening, the higher chance you’ll get the results you want! No Risk 100% Money-Back Double Guarantee! Because I believe in this program so much, I’m going to remove any and all risk to you. 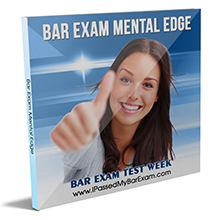 You are a partner and teammate in this battle against the bar exam. So, you will receive a DOUBLE GUARANTEE! If you try this program out and for whatever reason don’t pass your bar exam, just email me, and I’ll refund your amount, no hassle, no questions asked – that’s it. I have no problem making this agreement with you. 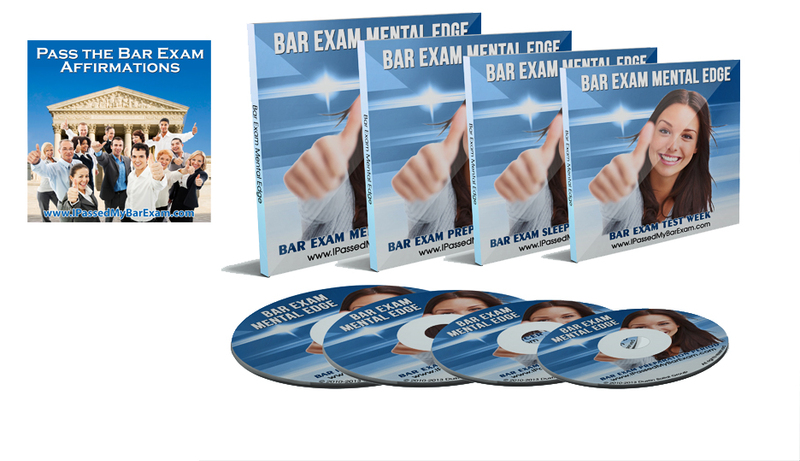 My Goal is for you to pass your bar exam with this program. I believe in the power of this program. And I believe it will help you pass. If you don’t pass, then I haven’t done my job.